The annual EAS Conference and General Assembly 2017 had been successfully held as a part off the XIV ENSE Forum at the Sport Summit 2017 in Aarhus, which is the actual European Capital City of Culture. Between September 12-14 about 240 participants from 22 countries visited the Sport Summit Aarhus 2017. 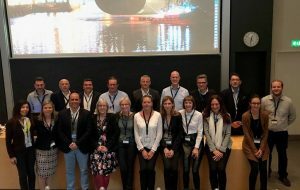 The event was hosted by the University of Aarhus and Elite Sports Academy Aarhus (ESAA) on behalf of the European Network of Sport Education (ENSE) in collaboration with the European Athlete as Student (EAS) and several other partners. The conference focused on 3 piles in the field of elite sport and education. Talent Development, Dual Career and Sport Education under the frame of European policies in conjunction to topics on health, inclusion and businesses, which were discussed in formal speeches and keynotes as well as academic presentations and athlete’s experience. Several representatives of institutions within the EU joined the Sport Summit. EU Sport Unit was represented by Ms. Agata Dziarnowska, Ms Sara Rozman, EUSA Education and Development Manager represented the European University Sports Association at the conference. International University Sports Federation (FISU) was represented by Mr Kole Gjeloshaj. The first conference day was held in the Aarhus Concert Hall, and opened by OC chair Dr. Jens Christensen, Prof. Laura Capranica (170912_opening speech Capranica), EAS President and ENSE President, Prof. Paolo Parisi, ENSE President. Three Keynotes presentations and table discussions of keynote speakers on talent development in sport, research and business started the conference. After a little coffee break the Danish Minister for Culture, Ms Mette Bock took the stage to speak about the Danish approach on dual career, what was strongly appreciated by the audience. A Swedish colleague invited her to take the same position in Sweden. She was followed by several scientists and researchers, who presented data and thoughts on the main topics of the conference. 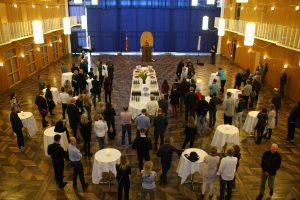 A reception at the City Hall concluded the opening day, and the Vice Major of Aarhus, Anne Nygaard, welcomed the guests from all over Europe. On the second day of the conference took place in the Aarhus University. With about 45.000 students enrolled it is one of the leading Danish public university and offers a bride the research spectrum and significant international scientific awareness. The day opened was opened with a lecture from keynote speaker Prof. Jean Côté from Quens University, who presented his study of modelisation for reaching elite sport, starting from the three elements “quality social dynamics”, “personal engagement in activities” and “appropriate settings to influence personal assets like competence, confidence, connection”, “character for outcomes focusing on performance”, “participation and personal development”. He was followed by parallel sessions on Talent Development, Dual Carer, Sport and Physical Education in Europe and the presentation of the SPEACH Project. In the afternoon, again parallel sessions and keynote speakers form different areas of sport including Ms Sara Slott Petersen – local former ESAA educated athlete, silver medallist in Rio 2016 Olympics – and Ms Agata Dziarnowska – policy officer of the EU Sport Unit. 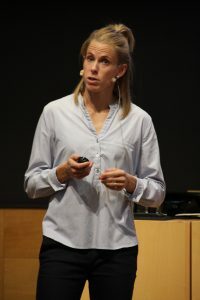 Ms Slott Petersen pointed out the importance of following an academic career alongside the sportive career and that this was crucial for her life balance and the possibility to have other personal goals beside elite sport. Ms Agata Dziarnowska from DG EAC Sport Unit focused on Dual Career issues within European policy and the framework for sport development in Europe. EAS Treasurer Prof. Mojca Doupona Topic (University of Ljubljana, SLO), member of the FISU Education Committee working group member on Dual Career, took the floor to present the European project AtLETyC for providing lectures on entrepreneurship to student-athletes who are finishing their sport career and are about to integrate professional life. The following presentations and debates focused on how to keep the talented persons combining sport and studies under the headline “do we lose some talents?”, to provide dropouts by circumstances based decision between both careers. Presenters and audience discussed the importance of leadership skills and interaction at the right level and in an appropriate manner between the different stakeholders (athletes, coaches, professors,..), pointed out different approaches on that between countries and the need of more scientific data in that field focussing on the educational part of the DUAL CAREER. In the evening, the EAS General Assembly took place in the University of Aarhus. At first, the winner of this years Bengt Nybelius Award, Lukas Linnér, from University of Halmstad (SWE) was honored for his research paper on “Swedish university student-athletes’ dual career scenarios and competences“ (Abstract). During the GA, EAS Secretary General, Mr Joerg Foerster presented the wide range of activities of the EAS board during the last 12 month and the improvement of EAS as a network of experts not only in Europe than as well for example in Asia. EAS President Prof. Capranica pointed out the involvement of EAS and its member institutions in several European projects on DUAL CAREER, and EAS Treasurer Prof. Doupona-Topic presented the actual financial data of the network which do have a continuous positive development in the last 4 years. By the reason of a change of duties in INSEP, Veronique Leseur, former olympic medal winner in fencing and former head of dual career services in INSEP needs to step down from the position within the board. The Executive Committee proposed that Ms Laurence Blondel who took over Ms Leseur`s duties in INSEP, should take her position till next elections during the General Assembly at the 2018 EAS Conference in Coimbra, Portugal (12.-14.09.2018). The present members agreed on that proposal and thanked Ms Leseur for her great achievement on EAS in the last years. GA was closed by the presentation of Prof. Antonio Figueiredo, EAS EC member and representative of the Faculty of Sport Science at the University of Coimbra, which is one of the oldest HEI in whole Europe and the outstanding views of City of Coimbra. He on behalf of the Coimbra OC invited the members and partners to join the next years conference, which will follow the EUSA Games 2018 in a city which is dedicated in manifold ways to university life. The “post conference day” was organized in cooperation of the Elite Sports Academy Aarhus (ESAA) and EAS workshop like and titled “How to develop a Dual Career Mindset in Youth Sport”. Practioners from primary, secondary and tertiary level of education, sport coaches and psychologists discussed after impact from best practices at the beginnig, like the H4DC project, the need for change in the certain approach of different stakeholders to a more holistic support of athletes within their most challenging phase of life. Participants left the actual European Capital City of Culture with lots of new ideas and aspects on sport and dual career in Europe and EAS President Prof. Capranica closed the 14th annual EAS conference with thanks to the organizer and emphasized the audience to improve number of collaborative EU projects focussing on DUAL CAREER and the academic pathway to the future after the lifespan of elite sport.